The morning of January 19, 2015 began for Joyce Smith like any other. Her 14-year-old son John, adopted by Joyce and her husband Brian from Guatemala when he was just an infant, had spent the night at a friend's house. The kids had that day—a Monday—off from school in observance of Martin Luther King Jr. Day. And Joyce was preparing to go pick her boy up when the phone rang. The message waiting on the line turned out to be every mother's worst nightmare. "When [John's friend's mother] called, she sounded off. I asked what was wrong," Joyce told Christian Cinema in 2017. "Cindy said that 'There's been an accident.'" As she learned over the phone, John and two friends had ventured out onto the frozen Lake Sainte Louise in St. Charles, Mo. With the ice as thin as it was, the boys fell through into the dangerously frigid waters below. While his friends escaped relatively unscathed, John had been unlucky enough to be submerged in the freezing water for a full 15 minutes before EMTs were able to reach him and transport his lifeless body to the nearby St. Joseph Hospital West were life-saving measures were underway. "When you get that telephone call and you hear that, I felt like I was moving in slow motion and everything around me wasn't real," Joyce recalled. "You want to get into a mode when you can move, where you can do something." By the time that she arrived at the hospital, she learned that doctors had been attempted CPR on John's cold body for 45 minutes with no signs of life. Dr. Kent Sutterer, whose daughter was in the same eight-grade class as John, was out of hope. As he told the St. Louis Post-Dispatch, he'd never seen anyone survive after being without a pulse for more than 25 minutes. "So at 43 minutes, I was not hopeful at all that he would come back," he told the news organization. "I was anticipating explaining to his mom that efforts were futile from this point forward." But Joyce had no interest in hearing what Dr. Sutterer had to say. A woman of deep and abiding faith, she entered John's room, "walked up to the end of the bed and felt his feet, how cold and gray they were," as she recalled to People in April, and began to pray—loudly. "I remembered in church all my life hearing this scripture that says, ‘The holy spirit will raise Christ Jesus from the dead," she told the magazine. "I thought to myself, 'You're either who you say you are or you're not.' The minute I prayed 'Holy Spirit, please come and give me back my son!' his heartbeat started." As Dr. Sutterer confirmed with local NBC affiliate KSDK at the time, "Within a matter of a minute or two, his heart started again." But with his temperature hovering at a dangerous 88 degrees and his blood's pH level well below the range doctors had ever seen anyone survive, John's prognosis remained rather grim. "His pupils were just minimally reactive, and he was taking occasional gasping-type respirations," the doctor told the Post-Dispatch. He thought to himself it would be only a matter of days, if not hours. Elizabeth Smart "Thrilled" Missing Teen Jayme Closs Was Found Alive: "What a Miracle"
John was stabilized and airlifted to Cardinal Glennon Children's Hospital in St. Louis. There, doctors confirmed that the teen had multiple organ failure and showed barely any sign of neurological function. The doctor "told me that John wasn't going to live through the night and if he lived he was going to be a vegetable," Joyce told People. "And he made me mad. Because God had already assured me this was going to be okay." After John and his family arrived at the new hospital, five pastors—including John Noble, lead pastor at the Smith family's church, First Assembly Church in St. Peters—gathered in his room to pray. And it was there than Noble says he had a vision of two angels in the room and lights over John's head. "What I believe is that God was putting his brain back together again, almost rewiring it," Noble told the Post-Dispatch. "I know that sounds strange, but as soon as it happened, John's shoulders came off the bed, his eyes opened, and he grabbed my hand. I knew at that point that God was going to pull him through." By the next day, John was giving visitors the thumbs-up sign, despite the fact that he remained on a ventilator for eight more days. And despite the near certainty that John would have some sort of lasting brain damage, he walked out of the hospital on his own within three weeks with normal brain function. And no one in the medical community can really explain how. "The only factors medically that were really in John's favor is that this was a cold-water drowning," Dr. Jeremy Garrett told KDSK, theorizing that the cold temperatures of the water redistributed his blood flow and managed to keep his organs alive. But he conceded at the time that the recovery was like nothing he'd ever seen before. "It's a bonafide miracle," he declared. The Smith family agreed. Joyce, who went on to tell her family's story in the 2017 book The Impossible (which has been turned into the feature film Breakthrough, out April 17, with This Is Us star Chrissy Metz and One Day at a Time actor Marcel Ruiz playing Joyce and John, respectively), told People, "I have always believed that God's going to do what he says he does because I've seen it all my life. But this is like the Oscars of faith. The very moment that I needed God, he was there instantly. And when John's heartbeat started right up it was like, 'Thank you, Lord, for being so merciful for me,' which just set my faith forever in bedrock." New Month, New Movies: Which April Blockbuster Will You Be Seeing in Theaters First? The terrifying moment presented an opportunity for Joyce to shift her perspective as a mom, she admitted. "I've had to learn to let go," she told the magazine. "You learn that things like a messy room aren't that important because it could be an empty room. You learn to appreciate life and start looking at things that matter." For John, now 18, it was the opportunity for a fresh start. "I had a lot of issues," he said of his pre-accident self. "I was chasing after what I wanted instead of what God had for me." Despite having no memory of the incident—pictures of him and his friends posing on the ice moments before they fell through have only brought back bits and pieces of the day, he told the Post-Dispatch—and no lasting physical harm, he was left to grapple with what his survival meant. "I had to deal with answering the question of 'Why me?'" he told People. "After time and a lot of prayer and mentoring, I eventually saw that God is the only way to get through something like this." In the years since the accident, John has toured the country, speaking to young people. As for the future? "Next I'm going to college, hopefully marrying this one," he told E! 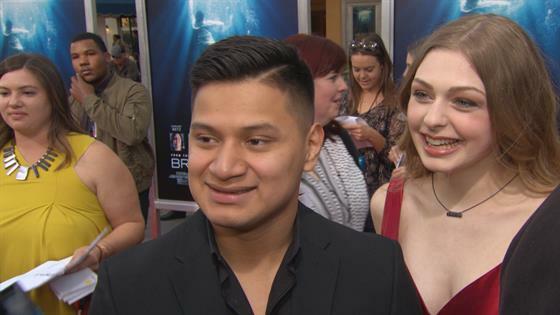 News' Erin Lim on the red carpet at the L.A. premiere of Breakthrough earlier this month, pointing to girlfriend Abby Medaris, "and seeing where God takes us." "It's an honor to be alive," he added, "and it's an honor to be able to share Breakthrough with the world." Meanwhile, aside from the obvious, mom Joyce is most grateful "for the love that seems to surround all of this," she told People. "The platform we have to tell people: Be happy for what you have; you don't know if you're going to have it tomorrow. Be thankful for it. And there's hope. There's always hope." Breakthrough is in select theaters now.